So far, the most successful graduate from William McKinley High School and the TV teen show, Glee (2009-2015) is actor, Darren Criss, currently starring in the American Crime Story series, The Assassination of Gianni Versace. For a close second, it's worth keeping an eye on Dianna Agron, who played the virginal star cheerleader and mean girl, Quinn, before enduring a rollercoaster of shame and redemption over the half-dozen seasons of the show. Agron has done solid work in a couple of adventurous and decidedly unfashionable indie films (Bare, Novitiate) by women directors. She now takes the lead role in the Canadian film, Hollow in the Land. In this working-class crime drama, shot around Castelgar, British Colombia by first-time feature director Scooter Corkle, Agron plays Alison Miller. She's a pulp-mill worker who's the guardian of her delinquent younger brother, Braydon (Jared Abrahamson, the hockey goon of Kevan Funk's Hello, Destroyer). Alison is quiet and defensive, and keeps clear of her co-workers because her family are, are more or less, the town trash. Their father is in jail for vehicular manslaughter. Their mother has been out of the picture for years. The day after Alison bails Braydon out of jail for fighting, the kid becomes the chief suspect in the murder of his girlfriend's father. After the man's body is found dead, Braydon promptly disappears. Alison becomes an amateur detective, checking neighbours and the local bowling hall, searching in the woods and breaking into homes, to find him, or the real murderer. Her investigation rouses the anger of the town police chief (Michael Rogers) and a steady parade of other shady townsfolk. Their animosity is somewhat offset by the help of a friendly cop (Shawn Ashmore). In another awkward wrinkle, Alison has been having a secret affair with Charlene (Rachelle Lefevre), the murdered man's wife. 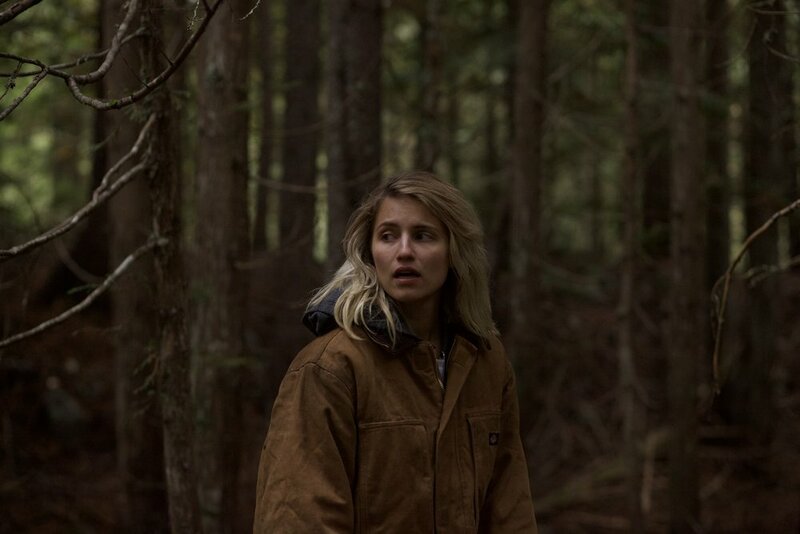 Hollow in the Land has an unmistakeable echo of Debra Granik's 2010 Winter's Bone, with its strong female lead (Jennifer Lawrence) and hillbilly gothic atmosphere. But there are worse models. Performances are mostly solid and Agron is very good, emotionally contained in the role of a small-town outcast, lashing out when angry, drunkenly goofy on the phone flirting with her lover. The movie serves her well when it aims to be a poetic naturalistic study of small-town characters and their secrets. Repression seeps out of the desaturated colours and the cutaways to the mountains that encircle the town. Where Hollow in the Land falters is when it trades emotional depth for commercial action thrills. The film's second half seems to have been invaded by a cop-show parasite, as the 90-minute running time is stuffed with a tangled and improbable conspiracy plot, chases, wielded guns, break-ins and backstory revelations. The result is a like a mid-season episode of an episodic mystery series, where you want to fast-forward through the chases and shoot-outs to get to the slow parts, where the people reveal who they are. Hollow in the Land. Written and directed by Scooter Corkle. Starring: Dianna Agron, Shawn Ashmroe, Rachelle Lefevre and Jared Abrahamson. Opens at the Cineplex Cinemas, Yonge-Dundas. January 26.